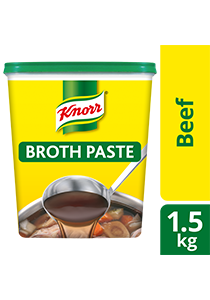 Only Knorr Beef Broth delivers that full, meaty taste in your soups and stews consistently. Made with carefully selected quality beef meat, extracts, fat and flavors, in an easy-to-use paste format. It gives your dishes a rounded taste, full-body flavor, and beef aroma - a perfect base for your beef-based stock, soupy dishes and stews. For beef stock with the basic beefy taste and light soup color, dilute 15g of Knorr Beef Broth Base per 1L of water. For a full-flavored and more intense beef stock, dilute 22g per 1L of water.